The art studio is a warm, open, organized, and well-stocked space where children are encouraged to build, explore, and expand their ideas daily. 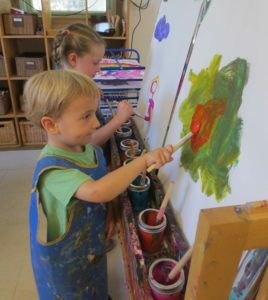 Through the Reggio Emilia philosophy, we understand that when a child has artistic freedom he/she has a greater sense of self-esteem, imagination, and creativity. The art teacher introduces a variety of tools and art mediums, but it is the child’s decision what to create and what to bring to life. The children care more, learn more, and enjoy an activity more when they produce their own creations. Music and movement is part of the daily routine at BPS. In addition, there is a music teacher who comes twice a month to work with the children. 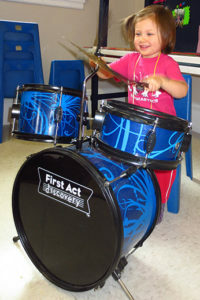 This special program incorporates a deeper study of music and allows the children to experiment with different instruments. The children will participate in and share what they have learned in two family music night events during the school year. 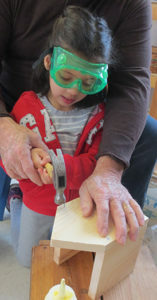 Brown Play School also employs a woodworking teacher who comes to work with the children twice a month. This program provides the children with the opportunity to learn how to use real tools in a safe and well-supervised environment. The children create some individual items that they are able to bring home such as a bird house or a stepping stool. They also work on group projects that benefit and remain at the school such as a balance beam for the play yard. 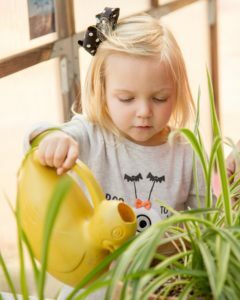 A greenhouse located in the play yard enables the children to be actively involved in growing, observing and caring for a variety of herbs and plants year round. It provides a huge sense of pride for the children to plant seeds and watch the many stages of growth. The children also carefully document the development of the plants in journals. Our trained yoga instructor has created a program specially adapted for the children’s little bodies and minds. 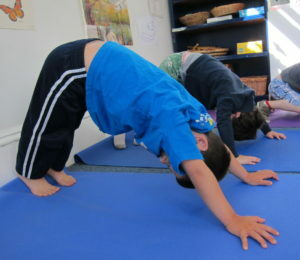 She has found unique methods of incorporating yoga into the children’s daily schedule that provides them with a fantastic kinesthetic experience. The benefits of yoga for children include increased self-awareness and self-esteem, lower anxiety levels, and increased physical strength and control.